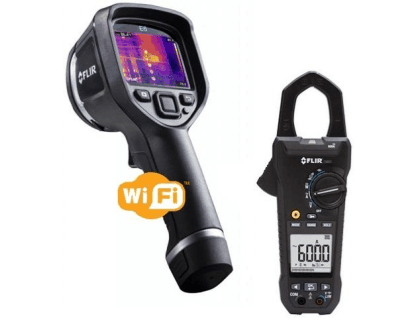 Learn about the Flir E6 Thermal Imaging IR Camera with Wi-Fi with CM82 True RMS Power Clamp. Includes features, pricing, and FAQs. The Flir E6 Thermal Imaging IR Camera is a thermal imaging camera for thermal inspection in buildings. The Flir E6 can connect to WiFi and features MSX thermal images, crisp resolution, and a focus-free lens. Enhanced job-site reliability and long-haul durability. Rechargeable 3.6 V Li ion battery; approx. 4 hours typical use. Local adaptation of units, language, date and time formats. UL, CSA, CE, PSE and CCC. The Flir E6 Thermal Imaging IR Camera retails for $1,999.00. Power supply/charger with EU, UK, US and Australian plugs. What is the resolution of the Flir E6 Thermal Imaging Camera? The Flir E6 has a 19,200 pixel detector with ±2% accuracy, offering the best image clarity during electrical or mechanical inspections. How easy is it to use the Flir E6 Thermal Imaging Camera? The Flir E6 features a focus-free lens and simple button navigation leading to on-screen settings, which makes this camera easy to operate when paired with the industrial-grade Flir CM82 power clamp. Where can I buy the Flir E6 Thermal Imaging IR Camera? You can purchase the Flir E6 from sites like Amazon and eBay, or directly from Flir.com. What are some Flir E6 Thermal Imaging IR Camera alternatives?